It is our greatest desire to make moving into a new home efficient and stress-free. We cover Riverside, Corona, Fontana, Redlands, Rancho Cucamonga, Chino and surroundings. Our professional movers will move your office to the new place instantly, so your business is going to keep working with no delay. We do express long distance moving only. We just prepare and load your stuff to the truck, then drive straight to destination, so your belongings will be delivered instantly! We provide full packing services, because safety of your belongings is most important thing during the move. Also we'll wrap your furniture using moving pads for a full protection. Our customer care team in the office will support you every step of the way from the booking through unloading via email or over the phone. We have a weekly special! Here’s our rates for 2 or 3 movers with a truck on weekdays as an example, but we’re always ready to send more movers or trucks for your big move! I was desperate to find movers as I'd been unable to focus on my move for work reasons. I called and when Sean answered, he was warm and friendly and patiently told me they could accommodate me for my moving date two days later. I was a little skeptical of the price offered as it seemed low for three guys and a 27 foot moving truck. He assured me that the price was inclusive of all taxes, gas, everything that I've been charged extra for. I went with it! Fast forward to today. Farrukh, Vlad, and Fathidin were here at the exact time promised. They wrapped up my furniture and packed everything else up quickly and professionally. The entire move was done within the estimated timeframe. And everything was done with the utmost care. I'm so pleased that I will recommend them to friends and family and would hire them to move again! Thanks guys! Keep up the great work! These guys are awesome! I've never worked with and organization that was more flexible and reasonable then Inland Empire Movers. Due to delays in the escrow process it was difficult to schedule my move date in advance. It seemed like every day the bank wanted another piece of paper or needed more time to review documents and the move date kept slipping out. I had found Inland Empire Movers on Yelp and Knew that I wanted hire them to do the move but wasn't able to provide a firm date. I called and explained the situation and they worked with me and we're able to accommodate my move date with less than 24 hours notice. They showed on moving day at exactly the agreed upon time and went to work packing my stuff. They extremely organized and very cautious with my belongings. Everything wrapped padded and packed with care. The team was very industrious and and constantly on the move (no pun intended). We got a late start because we didn't know what time escrow was finally going to close. In the end the guys had to make two trips and spent 12 hours on the job. They unpacked everything at the new house and cleaned up the discarded packing material and by midnight we were all done. I don't know that I've ever seen three guys work hard as these three guys did. I recommend Inland Empire Movers to anyone needing a professional and well executed move. If it weren't for the fact that I'm never, ever going to move again I would hire them for my next move in a heartbeat. We called this company on very short notice when we moved into our new house in Chino Hills and they were very flexible with accomodating our busy schedule. They arrived on time and did not waste any time getting started. The guys were very careful handling items and had everything professionally wrapped when moving things into the truck. We went from a 3 bedroom house to a 4 bedroom house in the same city and the whole process took about 4 or 5 hours. The price was the icing on the cake - very affordable. The guys were also very friendly and didn't assume things should be packed, they asked questions and got it all right. They did an excellent job and I would definitely use them again. Didn't have internet so this review is a little late. I used Inland Empire Movers April 1st to move from Ontario to Irvine, from a two bedroom apartment to a three bedroom house. These guys were amazing. Not one single nitch or mark on the doors and they wrapped every piece of furniture and were so careful loading and unloading. I couldn't believe how well they worked and quickly. Unloading was somewhat of a hassle because I asked them to take their shoes off before going upstairs (the landlord had just shampooed the carpet) and these guys did as requested without any complaints!! A huge thank you to Aslam, Mike, and Ansoan!! We couldn't have made it without your expertise and professionalism. You'll be hearing from us again for our next move! This is the first time I hired movers. My experience was amazing!!! I was able to move even the tiniest things without any damage. The movers were very friendly and and moved everything with great care. I had to worry about nothing. All the glass materials were intact and perfect. As it was my first move I thought there might be some damage, but there was nothing. Everything was perfect! The moving was a great experience from the beginning to the end. In the new place they also helped me to unpack and decorate my new apartment. Inland Empire Movers helped me immensely and made sure everything was moved perfectly and completely. The movers were very friendly and gave me suggestions where to put furniture in new place for better aesthetics. I was moving from a Studio to a one bed apartment. I had to hire movers because I couldn't physically move everything by myself. So, I was calling different places to see where I could get the best rate.They offered me the best quote. Moreover,I got a deal for 3 hours instead of 4 hours because i had a flexible time for moving. It was a great help for me because my moving distance was only about 100 yards. Outstanding experience for me!! The movers were fast, professional, and extremely nice guys. My stuff was moved to our new place in the same condition because they took great care of it! They packed my refrigerator, wardrobe and other big stuff like a total pro! They are amazing! They put all the furniture together and both guys made sure I was happy with everything!!! They provided an amazing service and I am grateful that I hired them! I could not have made it through that move without these great guys! In future whenever I need to move I will definitely hire them again and recommend them for everyone who wants a relaxed move without any tension!! The movers were great, very thoughtful and thorough. Things were packed and padded before we could even ask! Excellent packing skills! Every thing was well taken care of. Things that were antiques or fragile we notified them and special care was taken.This move was difficult for us but not for these movers! They had everything set up at our new address and positioned exactly as we wanted well before they left! While the move was difficult for my wife and I, These gentlemen made it all look easy and the whole experience was made easier by Inland Empire Movers!!! I/We whole heartedly endorse them to anyone needing to move!! I had a great experience with Inland Empire Movers, and would use them again in a heartbeat. They moved a ton of furniture - filling one and a half of their large trucks - from Riverside to LA. It's a long, complex story, but basically they were moving one house worth of furniture into another house that still had almost all of its furniture in it! All the furniture arrived carefully padded and expertly wrapped. They had to carefully maneuver around furniture in the second house, and even helped move some of the old furniture out of the second house into the back patio. They were friendly, courteous, and hard-working, and really took care of the furniture as if it were their own. Many, many thanks to Ayat, Komron, Jahon, Azam and Atham. You guys are the best. 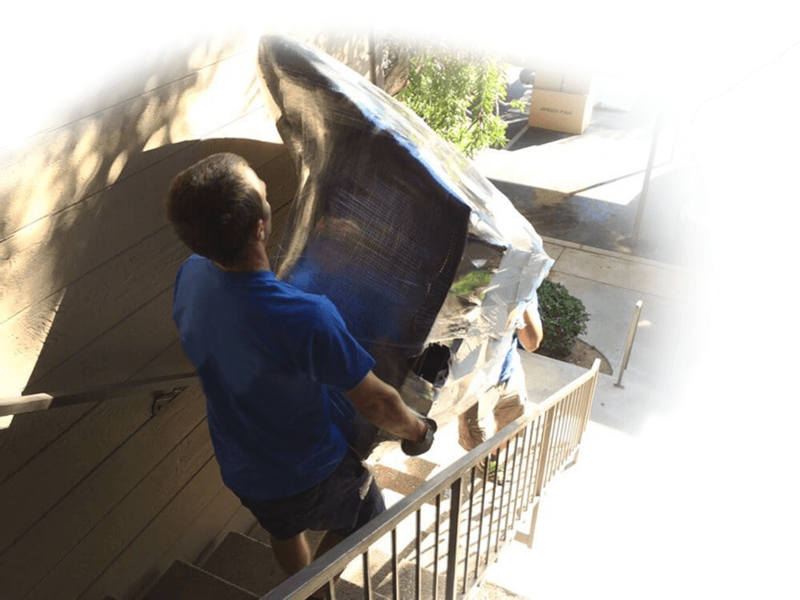 Inland Empire Movers are the best they are punctual, efficient, able to assemble, disassemble, wrap, and unwrap furniture without anything being broken. I had three movers and they work well together non stop even when I had leave with Mukhamed to pick up a part from Home Depot. I would recommend these movers to move anyone. This review is long overdue! I moved early December had had a 4 man crew with Mukhamed, Nina, Kesha, and can't remember the other name. They were polite and worked hard. They also hooked up my refrigerators upon move in. They wrapped up everything and were very careful. The prices were reasonable. Low stress move! Thanks guys. I hired IE Movers to move furniture from a storage unit to a two-bedroom apartment. I had a two-person crew headed by Mukhamed. Everything was perfect and I was very happy with the service and value. They called ahead to let me know when they would be coming, were efficient and careful, did everything I asked, were extremely polite, and it all went extremely well. I highly recommend Mukhamed and give him five stars ! I was very happy with their service and would use them again. My only complaint has nothing to do with Mukhamed. It has to do with the front office and the guy I spoke with (was it John ?) when I called to reserve the service. I knew it was a relatively simple job and could easily be done by a two-person team within the three hour minimum I was required to pay for. Nonetheless, John insisted I would need a three-person team, at a higher cost, and it took a lot more discussion than should have been necessary to order what I wanted. (In fact, the move took a little less than two hours.) Other than this unwelcome attempt at a hard-sell for an upsale, I was very satisfied with my experience. I worked with John on two moves, one for my mother and one for me on back to back weekends this month, he is organized and communicates well, John followed through with every detail to make my moving experience seamless. The movers names are Mohammed and Dimitri (Dima), we liked them so much I requested them for both moves, they are hard working, polite, honest, and outstanding movers, not a single item was scratched or damaged. Trust me when I tell you I don't write many reviews and I would never hire a moving company for mom without completely checking them out up front, these guys are the real deal and I would recommend this company to anyone (including my own mother). Thank you Inland Empire Movers !!! "...a true blessing." My wife and I have lived in the same home for over thirty years. We were happy and comfortable, but we finally found our next dream home. Moving after loving and living in a home for more than thirty years was a daunting task. So much to toss and so much to pack. When moving day finally arrived, we were so grateful for the expert assistance. Shaxriyor with Inland Empire Movers was right on time. He and his team worker tirelessly. Without complaint, without much direction, whatever needed doing got done. Furniture was wrapped, glass was carefully protected, the final things were packed. We were off to our new home. Shaxriyor's team placed everything exactly where it needed to go. Upstairs?--no problem; no complaint. At the end of the day, as we lay down for our first night in our new home, my wife summed up the experience, "Thank God we called those guys. They were a true blessing." Are you moving? Look no further! Inland Empire Movers, Stan (Stas)and his crew were everything you want and need in a moving service. Punctual, hard working, considerate, communicative and professional! They took so much care with wrapping and moving our belongings, they provided wardrobe boxes and disassembled our furniture too. Leading up to the move, I did my research and am so glad I settled upon this company. Their rates are comparable to the other services BUT they provide 3 movers for what you'd pay elsewhere for only 2 movers. Customer service was impeccable when booking and I even had to reschedule which was NO problem at all. Seriously save yourself time and stress, call Inland Empire movers, ask for Stan's crew if possible! You won't regret it! First of all, I contacted IE Movers and their staff was prompt, polite and easy to work with. I received a quote and confirmation promptly after I filled out their forms and made the calls, which was wonderful. On moving day, I received a call 30 min before arrival and 5 min arrival which was awesome and allowed to me to let them in and prepare last minute stuff. The guys were amazing. My parents and I were incredibly impressed with their punctuality, their work ethic and attention to detail. They did an incredible job packing everything up, wrapping and assembling everything in a prompt manner. They were also kind and helpful. Best money I've ever spent! I've always handled my own moves with the assistance of friends and family. I was tired of the stress it brings and thought I would save myself the headache this time. The two movers got to work immediately upon arriving. They wrapped all of my items very meticulously and made sure everything was secure in the moving truck. I'd say about 80% of their time was spent wrapping things - the moving part was quick! Both movers were very courteous and allowed me to be involved in the entire process so that things were done to my liking. I will never do another move without IEM. WHATâ€™S YOUR RATE AND WHATâ€™S THE COST OF MY MOVE? We have a weekly special and our rates start from $79/hour for 2 movers, but weâ€™re always trying to suggest the best option and that’s why we send different number of movers for different sizes, because if weâ€™ll send 2 guys for a big move itâ€™s going to take them forever, so itâ€™s not efficient. Normally we send: 2 movers and 1 truck â€“ preferred option for studio/1 bedroom; 3 movers and 1 truck â€“ preferred option for 2 bedroom/ small 3 bedroom or small size office; 4-6 movers and 1 or 2 truck â€“ preferred option for large 3-5 bedroom houses or medium/large size office. Honestly, the number of movers doesnâ€™t affect the final cost, because rate for less movers is lower, but itâ€™s going to take them more time to move everything, in the same time rate for more movers is higher, but theyâ€™ll move you in fewer hours, so itâ€™s going to be the same final amount either way. Let us give you an example please â€“ from our experience a 5 hours job for 2 movers is a 3 hours job for 3 movers and itâ€™s the same final price. Please contact us with information about your move and weâ€™ll be more than happy to provide a free quote. Yes, itâ€™s a standard of the moving industry and we have a 3 hour minimum Monday-Friday and a 4 hour minimum for weekends within a service area, but if youâ€™re moving from of a 2/3br or bigger house/apt the minimum doesn’t matter, because usually it takes more than 3 hours. Unfortunately we never know how long itâ€™s going to take, because weâ€™ve never seen what you have. Every move is different and unique in some way, because people have different furniture, different amount of stuff, different working conditions, different level of preparation, etc. Your movers will work as fast as possible and weâ€™re not going to waste your time. Also we donâ€™t charge for any breaks or overtime. You just pay for the service time and your total time depends on what you have and what you want us to do. If you want to save your time please pack everything as much as you can. If everything is packed, boxes and ready to go itâ€™s going to be much faster. ARE YOU GUYS ABLE TO DISASSEMBLE/REASSEMBLE MY FURNITURE? Absolutely! Our movers will bring all the tools and equipment and they will disassemble your furniture and put it back together at the new place. You pay the driver at the end of the move. You can pay him cash or use your credit/debit card. All our movers are full time employees, theyâ€™re trained professionals with a background check, so you have nothing to worry about. WHATâ€™S THE SIZE OF YOUR TRUCK? DO YOU THINK EVERYTHING IS GOING TO FIT IN ONE LOAD? We provide 12â€² trucks for studio or 1br and 26â€™ truck bigger moves. Itâ€™s like a 10Ã—20 storage unit, one car garage or larges U-Haul. Usually itâ€™s enough for a regular 3-4br house, but every house is different, so we canâ€™t guarantee to take everything in one load if you have more than that. If you think that 1 truck is not enough we can do 2 trips (if the distance if short) or provide 2 trucks. If you’re located in our service area then your time starts when we arrive to your place (when you sign the agreement) and ends when your move is done. DO YOU CHARGE ME FOR THE DRIVING TO/FROM MY PLACE FROM/TO YOUR PARKING LOT. No worries, we do not charge for that if you’re moving within our service area. Absolutely! Weâ€™re going to cover and wrap you furniture using plastic wrap and moving blankets to protect it and move with no scratches, damages or any other issues. Sure! We even include in the price all the packing supplies for your furniture such as plastic wrap, tape, moving blankets. Please contact us to get prices for packing and discuss your needs. Since we charge by the hour thereâ€™s not any additional charge for packing labor, but please be aware – boxes and wrapping paper are not included in the price. Feel free to request a packing service in advance and weâ€™ll discuss packing bundles and options. Yes, weâ€™re licensed and insured company. Our California Public Utilities Commission license number is MTR0191375. Riverside County: Riverside CA, Eastvale CA, Jurupa Valley CA, Corona CA, Moreno Valley CA and surroundings. San Bernardino County: Chino CA, Chino Hills CA, Ontario CA, Upland CA, Rancho Cucamonga CA, Fontana CA, Rialto CA, San Bernardino CA, Redlands CA, Montclair CA and surroundings. Los Angeles county: Agoura Hills, Alhambra, Arcadia, Artesia, Avalon, Azusa, Baldwin Park, Bell, Bell Gardens, Bellflower, Beverly Hills, Bradbury, Burbank, Calabasas, Carson, Cerritos, Claremont, Commerce, Compton, Covina, Cudahy, Culver City, Diamond Bar, Downey, Duarte, El Monte, El Segundo, Gardena, Glendale, Glendora, Hawaiian Gardens, Hawthorne, Hermosa Beach, Hidden Hills, Huntington Park, Industry, Inglewood, Irwindale, La Canada Flintridge, La Habra Heights, La Mirada, La Puente, La Verne, Lakewood, Lawndale, Lomita, Long Beach, Los Angeles, Lynwood, Malibu, Manhattan Beach, Maywood, Monrovia, Montebello, Monterey Park, Norwalk, Palos Verdes Estates, Paramount, Pasadena, Pico Rivera, Pomona, Rancho Palos Verdes, Redondo Beach, Rolling Hills, Rolling Hills Estates, Rosemead, San Dimas, San Fernando, San Gabriel, San Marino, Santa Clarita, Santa Fe Springs, Santa Monica, Sierra Madre, Signal Hill, South El Monte, South Gate, South Pasadena, Temple City, Torrance, Vernon, Walnut, West Covina, West Hollywood, Westlake Village, Whittier. Orange County: Aliso Viejo, Anaheim, Brea, Buena Park, Costa Mesa, Cypress, Dana Point, Fountain Valley, Fullerton, Garden Grove, Huntington Beach, Irvine, La Habra, La Palma, Laguna Beach, Laguna Hills, Laguna Niguel, Laguna Woods, Lake Forest, Los Alamitos, Mission Viejo, Newport Beach, Orange, Placentia, Rancho Santa Margarita. San Clemente, San Juan Capistrano, Santa Ana, Seal Beach, Stanton, Tustin, Villa Park, Westminster, Yorba Linda. We provide a basic moving insurance for your belongings that takes effect from the time your items first handled by our movers until your items reach your final destination. However, our coverage is basic per the California PUCâ€™s standard of $0.60 per pound of damages. For example, if your 30 pound chair is damaged, weâ€™re required to reimburse in the amount of $18.00 ($0.60 x 30 pounds = $18.00). Therefore, we highly recommend purchasing additional coverage known as â€œthird party insuranceâ€ through www.emoveinsurance.com. Their rates are very affordable, costing between 1% to 2% of the total value of your item(s) value, and insures them at their full value. Full coverage of your belongings is your responsibility to arrange and is not offered by our company. Due to California PUC law, movers CAN NOT be held responsible for valuable items, such as cash, jewelry, documents, etc., so please make arrangements to transport these items personally. We take many precautions to avoid damages to your belongings. In the event damage occurs, the customer and crew are BOTH required to discuss the matter immediately to determine the cause. If damage results from a mistake on the part of our company, every attempt will be made to assess the amount of damage and have it properly fixed. If an amount can be agreed upon between BOTH parties, the matter will be settled immediately with payment in full by our company. If the amount cannot be settled immediately between BOTH parties, the moving invoice must still be paid in full as damage claims are not valid according to insurance regulations if the invoice remains unpaid. At this point, a claim will be filed with us to compensate you for any damages. Please select your insurance option: Basic coverage â€“ minimal coverage mandated by the California PUC covering $0.60 per pound of belongings. Third Party Coverage (recommended) â€“ a very affordable option costing between 1%-2% of the value of your belongings and covering them in full. We are the best cheap moversÂ company in Riverside and Inland Empire, because weâ€™reÂ an affordable, reliable, honest, professional moving company. We provide the lowest all-inclusive rates among the licensed and insured moving companies in Los Angeles, San Bernardino, Orange, Riverside counties. We have highly trained moving crews and friendly customer care teamÂ interested inÂ customer satisfaction andÂ providing best service at an affordableÂ price. We provide the clean, well-maintained, large, fully-equippedÂ moving trucks to safely transport your precious possessions in Riverside and surrounding cities. Our billing system is simple and transparent. There are NO hidden fees or â€œlast-minuteâ€ charges for packing supplies, gas, truck, equipment, tools, stairs, assembling/reassembling, narrow hallways, long walking distance. We include in our rate for moving all the packing materials to protect and safely transport your furniture (shrink wrap, tape, moving blankets, wardrobe boxes) Our Riverside moving company is fully licensed and insured, locally owned and operated. Please let us know if you have any questions. Thank you! Didnâ€™t find the answer? FEEL FREE TO CONTACT US! Please give us a call to make a reservation!